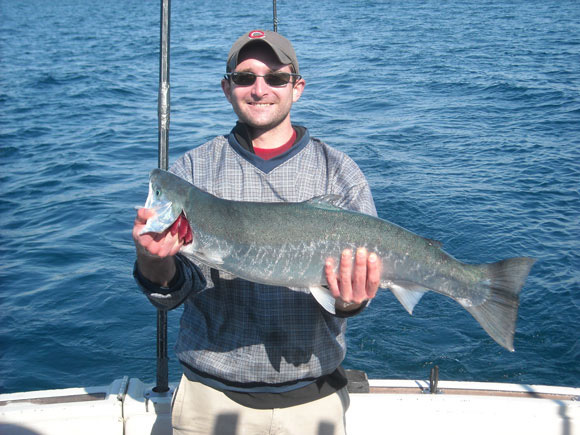 The Steelhead or Rainbow Trout as it is often referred as is the most acrobatic Lake Michigan species. Often referred to “Jumpers” the Steelies are often recognized by their acrobatic leaps out of the water. These photo opportunistic fish are best sought after in the Late Spring thru Late Summer. Whether you are Charter Fishing out of Montrose Harbor Chicago or in Northpoint Marina, Winthrop Harbor, IL. these fish are around and sometimes plentiful. Rainbow Trout or Steelies as we call them are truly one of the most exciting game fish in North America. These acrobatic underwater missiles come leaping out of the water with a great desire to fly whenever they are hooked. Because of there very hard hitting aggressive nature they break lines & snap hooks right off of lures frequently. The ratio of Steelies hooked versus Steelies landed in the boat is probably the lowest of all Great Lakes Salmonoid species. Steelies range in size from 6 to 10 lbs average. The best chances for catching Steelies are the months of June, July & August (Also the best weather of the year). We call them “JUMPERS” because they spend so much time jumping out of the water that they are completely tired out when they get to the net. Illinois State Record 31lbs 6.72oz. Wisconsin State Record 42lbs 8oz. Indiana State Record 26lbs 10oz.